In the Management Portal, open the Users page (click [Home] > [System Administration] > [Security] > [Users]).Click the name of the user that you are interested in. Click the Roles tab. 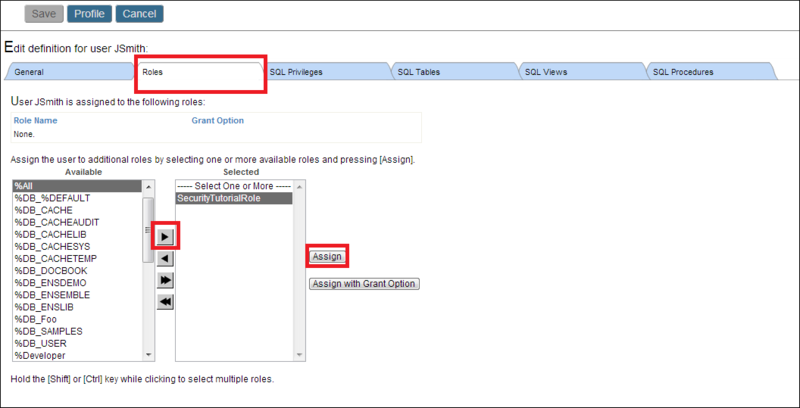 Then click on a role in the Available column on the left. Click the arrow in between the columns. The Selected column on the right displays the role. Click Assign. The interface lists SecurityTutorialRole as one of the user's roles. To remove the user from the role, simply click the on the rightmost column of the table. To learn more about the properties of Caché users and creating Caché users read Users in the Caché Security Administration Guide.